The project awarded in 2016 is dedicated to European solidarity. Research activities include scientific publications, research databases and the organization of international conferences. To launch the scheduled research, the members of the IEE-ULB’s academic and scientific staff are to be integrated into thematic teams. The selected themes echo the focus on European solidarity mechanisms, and bridges disciplinary divides. (4) Solidarity and European External Action – Coordinated by: A. Weyembergh, E. Lopez Lucia, F. Ponjaert. On the basis of preparatory documents prepared by each coordinating team, participants discussed their understanding of the concept of Solidarity that serves as pivot for said research activities. Tasks were dispatched so as to proceed with the implementation of activities. A specific focus was put on the substance that would have to feed into the first interdisciplinary conference to be organised in May 2017. The organisation of the interdisciplinary conference in EU studies on Controversial European Solidarity – From Burden Sharing to Integration, detailed below, is a second step towards that goal. This was the occasion to launch external collaborations, and especially to develop the cooperation with our partner University, the VUB and its IES. 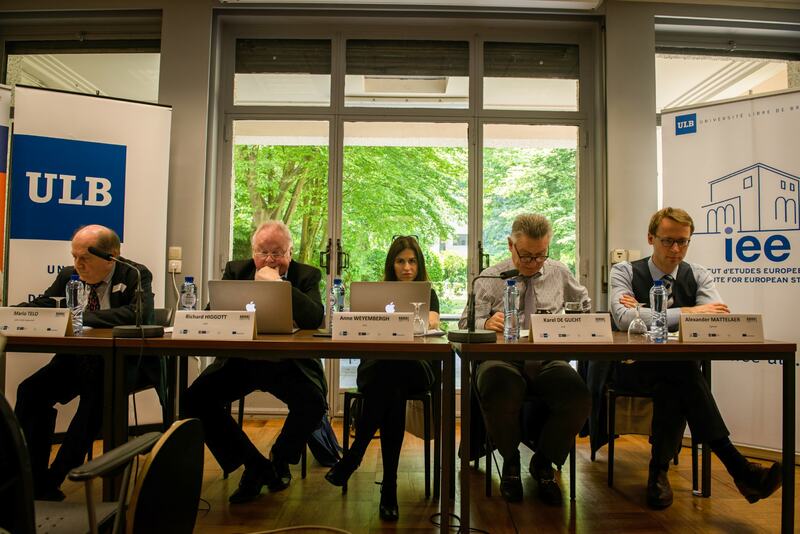 For the IEE-ULB Jean Monnet Centre of Excellence to serve as focal point of expertise, the list of available researchers, academics and associated staff must be readily available for third parties. Currently, said expertise is spread over a variety of departments, centres and faculties. With the help of the Jean Monnet programme, the IEE-ULB would serve as an integrative platform bringing together (in a user friendly format), the list of people, fields and human resources available. The resulting expertise database will be the product of a pooling of available datasets by way of a newly setup data system to be managed at the IEE-ULB level. Our virtual library, is a database that gathers all research, outreach and publications produced at the Université libre de Bruxelles on the European Union, by researchers and academics affiliated to the Institute for European Studies at the ULB. One of the main features of our research agenda is its interdisciplinarity. It emanates from a dynamic process in which the IEE-ULB Jean Monnet Centre of Excellence and its partner faculties define the work that you can now consult at the one-stop-window that is ULBLEU. Visit our online library in European Studies. The two-day conference “Controversial Approaches towards European Solidarity – From Burden Sharing to Integration” (EUEA17) represented an opportunity for an academic and policy oriented discussion on migration, asylum, security, jobs, education, health, inclusion, as well as on financial sustainability, tax regulation and economic governance, all through the lens of solidarity. Bruxelles, Larcier, 2019, under preparation. Solidarity is one of the fundamental values that sustains the process of European integration. At the center of political discourse since the beginning of the 1950s, it has been invoked as a vehicle for bringing Member states and their citizens closer together. Even though it is enshrined in the treaties, solidarity poses numerous questions. It is at the heart of major challenges for the Europe of today and tomorrow. Since 2008, the economic and financial crises have highlighted the limits of European solidarity. The debt crisis in Greece is one of the examples that has marked the recent history of European integration. Solidarity is no longuer a value that unifies Europeans around common values; it has become a source of conflict and tensions between the North and the South, the East and the West, the net contributers and the beneficiaries of European funding, the good and bad students of the Eurozone, the countries located at the center and those at the fringes, the partisans of austerity as the only and unique response to the crisis and those who contest the preminence of the economy over the social challenges. For its specificities and its interdisciplinary nature, this publication constitutes a unique reference on the concept of solidarity destined for researchers and students, European and national political decision makers , as well as citizens interested in the current challenges of European integration and the transformation of nation states. Two other edited volumes are under preparation and to be included in a second series managed by the IEE-ULB Jean Monnet Center of Excellence: the Routledge “Globalisation, Europe, Multilateralism” series. This textbook is to provide a shared reference for researchers and students interested in European studies with an eye on bridging their disciplinary divides, thus bringing together legal scholars, political scientists, sociologists, economists and historians. The volume will prove a useful complement to the existing literatures on teaching and research in EU studies. The production of this original textbook is rooted in the IEE-ULB own unique experience of interdisciplinary, which highlights a shift within EU studies away from both trans-disciplinarity and multi-disciplinarity in favour of more integrated forms of research and teaching qualified as interdisciplinary. To learn more about the IEE-ULB Jean Monnet Centre of Excellence and its teaching projects, please visit the dedicated page.